A purine is a heterocyclic aromatic organic compound. That's the précis. The full explanation is unlikely to bring any further clarification. However, if you are viewing this from a culinary angle, Gout, is probably the reason you are here. Purines are known triggers of gout (or podagra if it only affects the big toe). Causing elevated uric acid levels, the uric acid crystalises and builds up between joints of the big toe, heels, knees, wrists, and fingers. The onset normally occurs because of the lower body temperature at that time. A moderate amount of purine is also contained in beef, pork, poultry, other fish and seafood, asparagus, cauliflower, spinach, mushrooms, peas, lentils, beans, oatmeal, wheat bran, wheat germ, and hawthorn. Dietary causes account for about 12% of gout, and include a strong association with the consumption of alcohol. 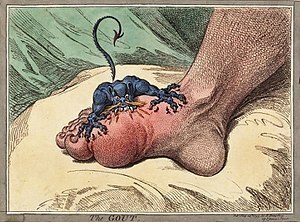 Gout was historically known as "the disease of kings" or "rich man's disease." Page modified 18:00, 13 January 2015.